Photo. 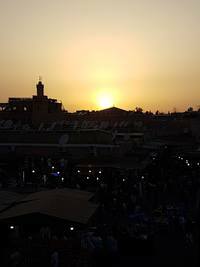 Sunset above the bustling Djemaa El Fna square in Marrakesh, Morocco. © Travel Explorations. The muezzin called the prayer could be heard across whole the city in Marracesh. The musicians and performers took a short break and the sky was filled with magical reds, oranges and pinks, marked the end of another fabulous day in Marrakech. As the sun sets, the square changes its shape. It turns into one of the world's busiest open air restaurant and a veritable open-air theatre. It`s something else. There is so much going on. Plenty of hassle, lots of fun and almost impossible not to get lost. Based on my experiences in July 2018 I will say: it`s the perfect chaos! Watch photos on our Facebook page: "In the darkness the city reemerged into another kind of world, and created an unique atmosphere". As Lonely Planet writes on its website: "Think of it as live-action channel-surfing: everywhere you look in the Djemaa El Fna, Marrakesh’s main square, you’ll discover drama in progress. The hoopla and halqa (street theatre) has been non-stop here ever since this plaza was the site of public executions around AD 1050 – hence its name, which means "assembly of the dead"." Unesco declared the Djemaa El Fna a "Masterpiece of World Heritage" in 2001 for bringing urban legends and oral history to life nightly. Although the storytellers who once performed here have since given way to acrobats, musical performers, and slapstick comedy acts, Djemaa's nightly carnival continues to dazzle. Berber musicians strike up the music and Gnaoua troupes sing while henna tattoo artists beckon to passers by and water-sellers in fringed hats clang brass cups together, hoping to drive people to drink. Sometimes the old market is really stressful and overwhelming. As a visible tourist, you shouldn`t expect a discrete shopping experience. Vendors find you everywhere, and they will follow you. They are often brazen and annoying - don`t take "no" for an answer, but this is the price you have to pay to be there. This is a show you don't want to miss and it's a bargain too. Applause and a few dirhams ensure an encore. While wandering around the Djemaa at any time of day stay alert to cars, motorbikes and horse-drawn-carriage traffic, which whiz around the perimeter of the plaza. How to navigate in this labirynth? The old market are divided into different sections, but it takes a while to figure that out. There is a main passageway through the souk - bazaar - from the main square. Its fairly straight and unless you venture down off down a side lane, you will not get lost. This souk is a huge and complex labyrinth of alleys, but it's well worth to get lost here for a day. According to Wikipedia, the origin of its name is unclear: Jamaa means "congregation" in Arabic, probably referring to a destroyed Almoravid mosque. el Fnaʼ or finâʼ can mean "death" or "a courtyard, space in front of a building". "finâʼ in arabic commonly means "open area", straight translation would be "the gathering/congregation area". Other meanings could be "The assembly of death," or "The Mosque at the End of the World". Another explanation is that it refers to a mosque with a distinctive courtyard or square in front of it. A third translation is "assembly of the dead", referring to public executions on the plaza around 1050 AD. It was great to walk around in Djemaa el Fna square and just soak up the atmosphere. This place is sure to take you back in time! Especially in the evenings the bazar was crowded. With so many different sights, entertainments, shops, sounds and smells, I felt totally confused in the beginning, but after a while I started to enjoy it. There aren't many places left like this in the world outside Morocco so wandering in the maze of streets and shops is an unique experience. Just dress up modestly, wear a smile, be polite, and don't ask the price of things you aren't ever going to buy, the less troubles you get. Most people are nice. Some sellers are less pushy than others, and bargaining can be quite fun when you're in the right mood! The official name of Morocco is the Kingdom of Morocco. There are about 33 million people living in Morocco. Arabs and Berbers make up majority of the population of Morocco, followed by Jews and others. Morocco has 2 official languages: Arabic and Berber. Berber is a dialect in North Africa that has Afro-asiatic roots. French is also spoken by 1/3 of the population, and is a mandatory language in schools. The capital city of Morocco is Rabat, although the largest city is Casablanca with nearly four million people. Morocco gained independence from France in 1956. Population: 1.70 million (city), but over 2 million including suburbs. Area: Marrakech is the capital of the mid-southwestern region of Marrakech-Tensift-El Haouz, close to the foothills of the High Atlas Mountains. The Jemaa el Fna is the heart of the city, which is divided between the medina, the French-built New Town (ville nouvelle), Gueliz, and the suburbs. Language: Arabic is the official language, but many people speak Amazigh (Berber language) and French. English is increasingly spoken in tourist areas. Climate: Marrakech has a dry climate with hot summers and cool winters. The best time for visiting is between March and June and from September to December. There is usually snow on the High Atlas from December to April/ May. Number of food stalls in Jemaa el Fna: over 100.